Traditional Chinese musicians and dancers regaled athletes, officials and volunteers at the Closing Ceremony dinner for the CGG WSF Women’s World Team Squash Championship in Dalian as the Liaoning Province seaport city celebrated the successful staging of the historic first world squash championship to be held on mainland China. Egypt, with a powerful squad boasting four world top six-ranked players, successfully defended the title – beating seven-times champions England to claim the title for a fourth time in 10 years. 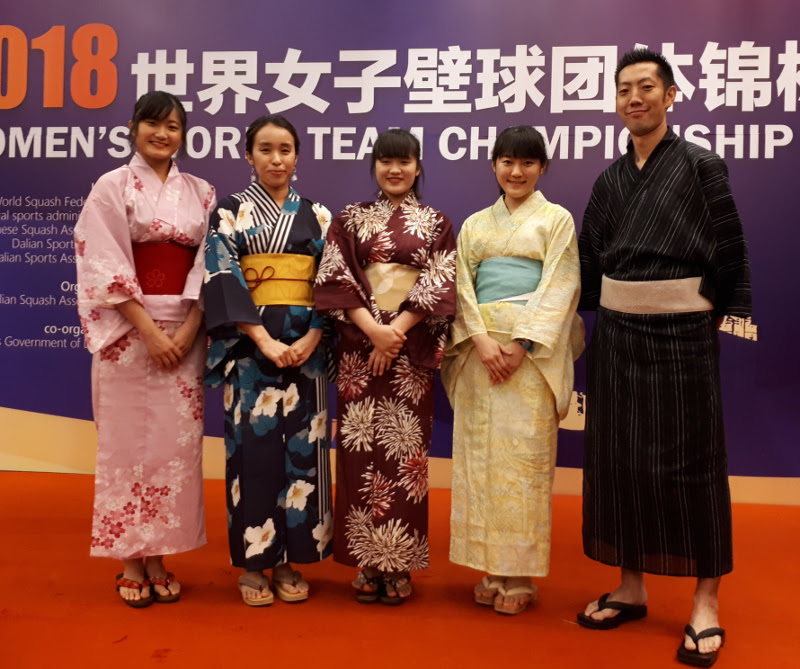 Athletes representing the 16 nations, many in traditional costumes (Japan team & coach pictured above), heard speeches from local dignitaries and cheered presentations to a team of local volunteers and referees from both China and overseas – all of whom had made the 21st staging of the biennial World Squash Federation championship at the Xigang Gymnasium a major success. In addition to two all-glass showcourts (pictured below), the venue also boasts four permanently-sited all-glass courts. At the farewell dinner, the local Association’s Chairman Lu Zhi Jun said: “We are very grateful for the trust the WSF and the whole community of squash gave us. We also thank the Dalian Government and the Dalian Sports Bureau, plus the athletes, officials and all the volunteers who made it possible to stage this successful event. 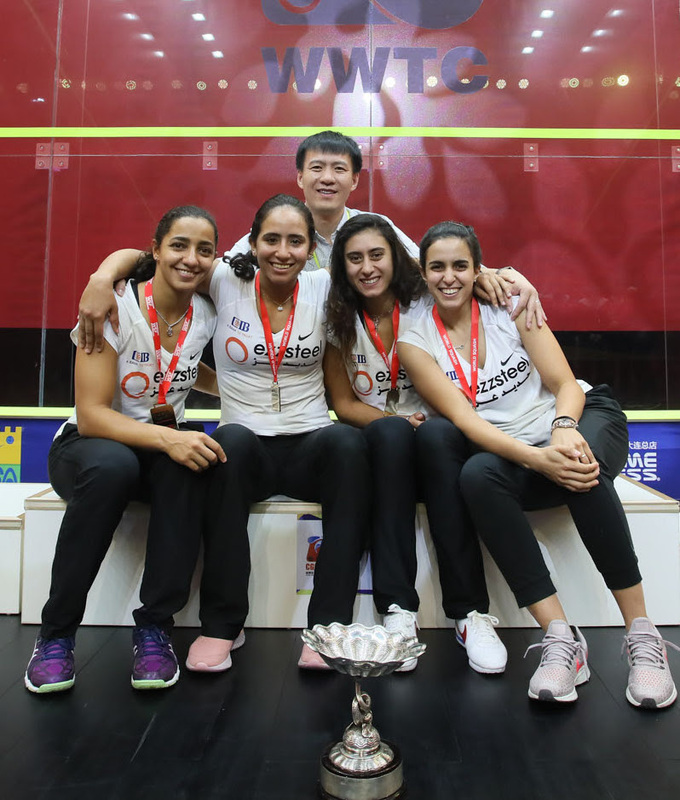 WSF CEO Andrew Shelley commented: “These WSF Women’s World Championships have shown that China is not just growing in squash, but actually leading the way! 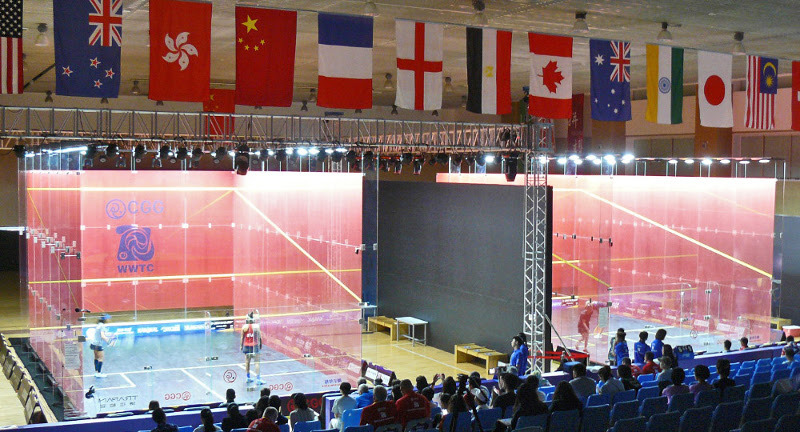 The first-ever world championship played entirely on glass showcourts – the six CGG courts providing a memorable Dalian staging to complement the superb overall arrangements and hospitality the visiting players and officials experienced. 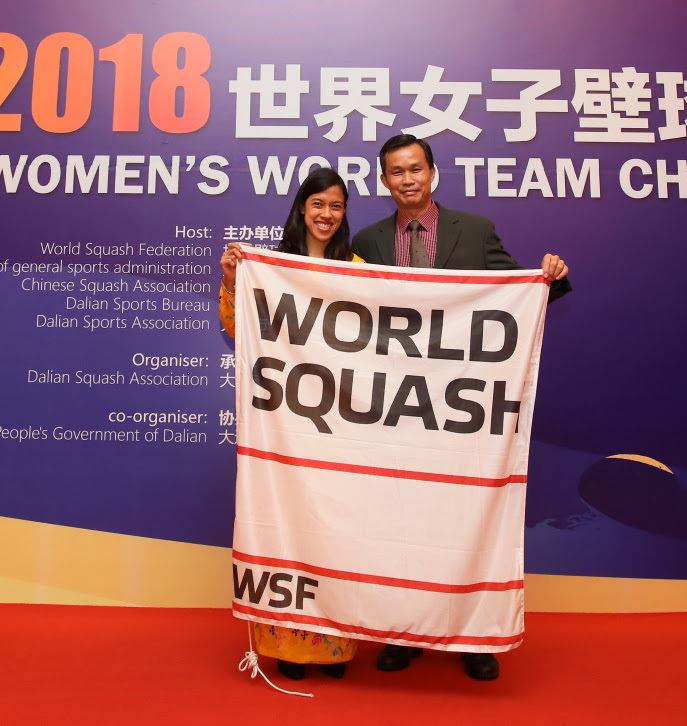 The final act of the closing ceremony was left to WSF Vice President Huang Ying How who handed over the WSF flag to 2020 hosts Malaysia, represented by former world number one and nine times World Team Championships’ participant Nicol David (both pictured below).